Donating through Paypal is quick and easy! 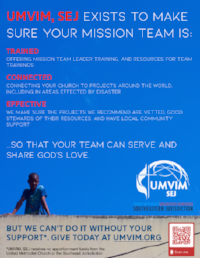 100% of online giving will be given directly to UMVIM, SEJ. Giving Tuesday is a worldwide effort aimed at raising resources and awareness for non-profit and charitable organizations; it has been our single largest giving event for the last two years. It is held each holiday season on the Tuesday following Thanksgiving, after "Black Friday," "Small Business Saturday" and "Cyber Monday." Make your check payable to your local church. Write UMVIM, SEJ and Advance #901875 in the memo line. Drop your gift in any United Methodist church offering plate or give your gift to your church treasurer so that your church and annual conference will receive Advance credit. Consider giving Alternative Gifts In Honor or In Memory of those you love. By shopping through the UMC Market, a percentage of your purchase can benefit our ministry. 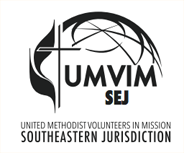 Simply sign up/sign in and select UMVIM, SEJ as your UMC ministry of choice. If you have questions or want more details, please email sejinfo@umvim.org. Appreciated securities, usually common stock, can provide a tax-efficient way of making your gift. Please call the office at 205-453-9480 or email sejinfo@umvim.org. If you are interested in including us in your will or estate plans, please call the office at 205.453.9480 or email sejinfo@umvim.org. Please call the office at 205-453-9480 or email sejinfo@umvim.org to begin those conversations. We always appreciate your prayers and words of encouragement.